How technology ended the door to door maintenance collection saga? The vicious cycle of maintenance calculation, payment dues, reminders and door-to-door maintenance collections kept most of the apartment management associations on their toes a few years back. Keeping a track of the defaulters, reminding the defaulters to pay the maintenance and then finally collecting the same made the already difficult job of managing an apartment even tougher for the apartment associations. Also, since there was no way of ensuring whether a resident has read a maintenance fee reminder notice posted on the apartment notice board, the only way out for the RWA (Resident Welfare Association) was to reach out to residents and collect maintenance on a door-to-door basis. This was a highly painful and a time consuming process. In addition, one had to depend excessively on manpower for this activity, which increased the costs as well. Thanks to technology, long gone are the days when apartment management associations were reaching out to residents on a one-to-one basis to collect maintenance. Management associations now use sophisticated apartment management software to simplify their maintenance collection process to an extent of a single mouse click! One of the misconceptions that most of the apartment management associations had was about apartment management software being very costly. This misconception was cleared, when a lot of apartments started using ApnaComplex, a cost-effective subscription-based leading apartment management software with zero hardware costs and an ongoing support. The cost of the software is directly proportional to the number of units an apartment has, making it more economical than ever for the apartment management associations. How apartment management software helps the management associations in timely collections? Timely reminder for payments – The apartment management software instead of sending reminders to each and every resident one by one, empowers the management association to now send automatic reminders to all residents at one go via email/SMS. Residents don’t mean to default on maintenance payments, it’s their hectic schedules and absence of a mechanism to remind them in a timely manner that makes them miss out on submitting the maintenance charges on time. A reminder system reduces the default rate up to a great extent. Ease of paying maintenance charges – The software comes with a payment gateway that empowers the residents to make their payments online and directly crediting the amount to society’s bank account. The payment can be made via credit/debit card or net banking as per resident’s convenience. This eases the residents from the whole ordeal of coming to the society office just to drop a cheque or pay in cash and in the same time saves the management association from the entire reconciliation effort. Reduces manpower costs– The software automates the entire process of collections and reduces the requirement of any manpower for collections. The notices/reminders are sent in a timely and periodic manner to the residents and there is absolutely no requirement for a person to conduct door-to-door collections or inform residents about payment defaults. Filter the list of defaulters – The apartment management software enables the management association to filter the list of defaulters. The entire process gets automated and a list of residents whose maintenance payments are due can be easily drawn out along with the penalty to be charged from them. This helps the management association to identify the exact number of defaulters to be contacted. Emails/SMS to be sent out to defaulters is also automated through this software reducing the manual work up to a great extent. Meets expectations of both apartment management association and residents – A lot of times a warning message posted on the apartment notice board about maintenance default provokes residents to get into a verbal spat with the management associations. A timely reminder via SMS/email can cause lesser disputes, higher collections for management associations and lesser defaults on behalf of residents ensuring their harmonious living in the apartment. Sun City Apartment Owners Association (SAOA) managing an apartment of 1200+ apartment units revealed that using ApnaComplex, a cost-effective subscription based apartment management software has led to a quicker collection cycle and much lesser defaulters in their apartment. It has enabled online payments with about 55% payments now happening online reducing the manual effort of reconciliation up to a great extent. The association now has a much clearer view on individual resident account and collection of long pending dues has been possible only because of ApnaComplex. Maintaining a full-time staff or volunteers who lack expertise/time while dealing with maintenance collections or collecting default payments can become a very expensive as well as tiresome process. Use apartment management software to relieve your association from the painful process of door-to door maintenance collections today! 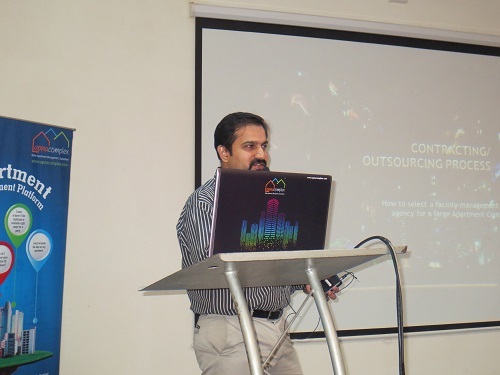 At the Better Apartment Management Conference held on Nov 15th 2014, Raja Sekhar, Co-founder of ApnaComplex.com presented “7 Habits of High Effective Managing Committees” of Apartment Associations. The presentation itself is packed with things that Managing Committees should be doing to be most effective and the talk was peppered with real life examples and scenarios that a typical managing committee member faces. The talk also offered guidelines on how to be a better committee member of the apartment association. The presentation is a first of its kind focusing on Managing Committees of Apartment Associations. The talk delves into how Highly Effective Managing Committees are different from others and bring amount a positive and visible increase in quality of life in the Apartment Complex during their tenures. The characteristics of these Highly Effective Managing Committees have been grouped into 7 different habits which should help any managing committee and apartment complex to become better. Have a question or need more information on the habits? OR Have some more Habits to share? Comment below and get the conversation going! Become Better at Managing your Apartment Complex – Get your society on to ApnaComplex – Today! 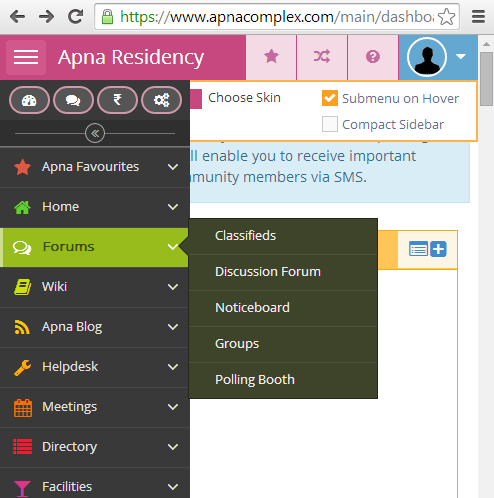 ApnaComplex is India’s leading web based Apartment Management Platform. Managing Apartment Complexes is a tough job – Managing them efficiently is even tougher. Significant part of the problem lies in the fact that the people who manage the apartment complexes are volunteers with no formal background in dealing issues surrounding the apartment management. 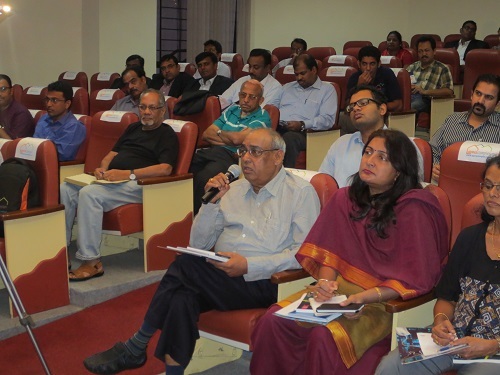 Better Apartment Management Conference conducted on November 15th 2014 by ApnaComplex was aimed to bridge this knowledge gap for Managing Committees. We have brought together experienced folks from various apartment complexes who have been there, done that to share with rest of the audience the secrets of managing apartments in a better way. Representatives from various associations, facility management firms, even property developers have attended the conference and every one has some learning to take away at the end of the event. Rajs, Co-founder at ApnaComplex welcomed the audience. Rajs, being part of managing committee in several capacities for 5 years and have personally been part of several hundred committee meetings of various apartments, spoke about “7 Habits of Highly Effectively Managing Committees” which all the managing committee members in the audience could relate to and benefit. The presentation covered Seven Habits that a Managing Committee could follow in order to effectively manage their Apartment Complex. The presentation covered on various topics like working as a team, importance of listening to members, transparency, not resigning for minor issues, responding with facts with no emotions, including every one, not clinging on to the committee posts and so on. This was very well received by the audience with lively interactions. 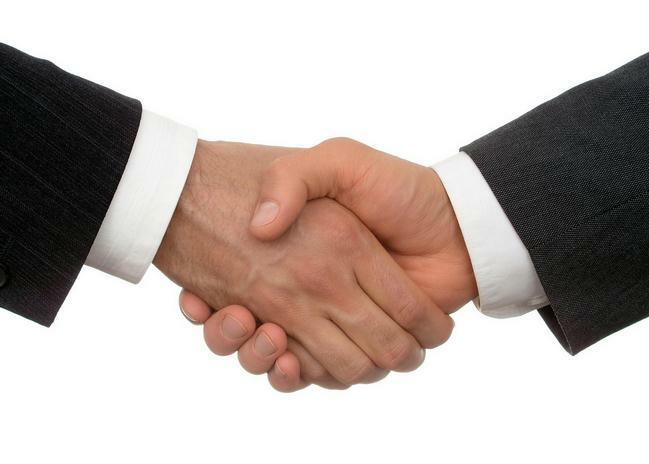 Selecting a firm marks the starting point in facility services. Periodic checks on performance are a must to ensure resident satisfaction. Concorde Manhattans is a 1200 flat apartment complex and has been using ApnaComplex portal for one and half years. It was time for a short tea/coffee break to buck up the energy levels of participants. 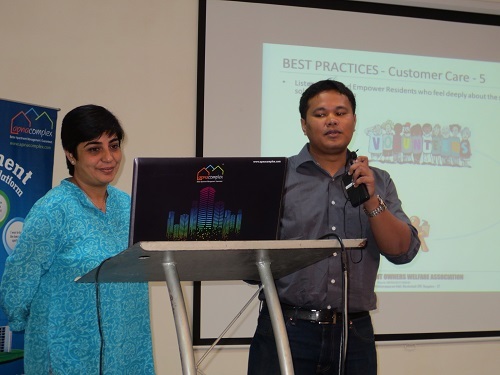 Immediately after the break was followed by an energetic presentation from Mr. Rohit Talukdar and Ms. Ipsita Bose committee members of Alpine Eco Apartments, on “Best Practices in Apartment Management”. Alpine Eco is complex with 800+ apartments located on Outer Ring Road. Alpine Eco has been using ApnaComplex.com for 3+ years. Rohit and Ipsita shared their best practices implemented at Alpine Eco managing the apartment complex and making life better for all the residents. Train your staff. Then rely on them. A tool is only as good as the committee that’s using it. Most people dismiss tools before using it. The presentation also included how ApnaComplex portal is playing a role in managing the apartment better. 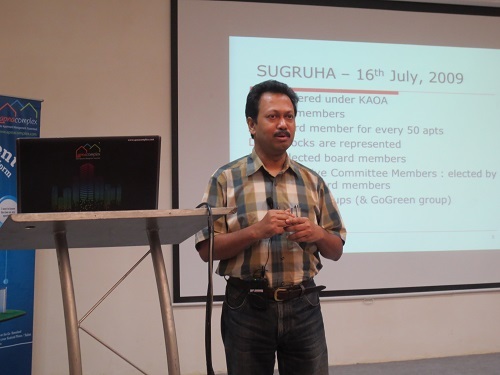 Then came Mr Subhranshu Banerjee, Co-founding Member, South City Group Housing Apartment Owners’ Association who gave insights and experience on managing ~2000 apartments and covering the following challenges. 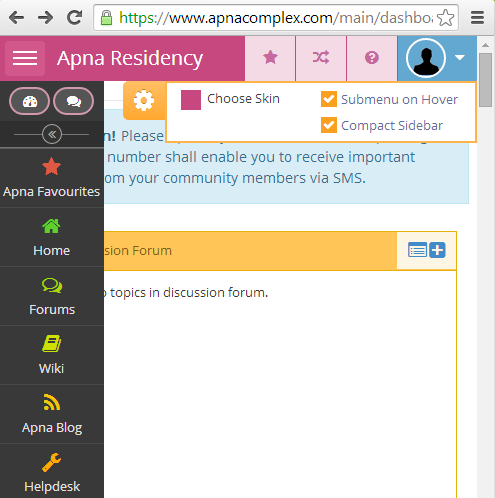 Shubho also mentioned how ApnaComplex portal is helping in managing the apartment better. The Q&A session did not stop for a long time post this presentation and we had to request the audience to take further questions later. Sathish stressed on how all of PEOPLE, PROCESS, TECHNOLOGY, and MEASUREMENTS should work in tandem to achieve Better Apartment Management. 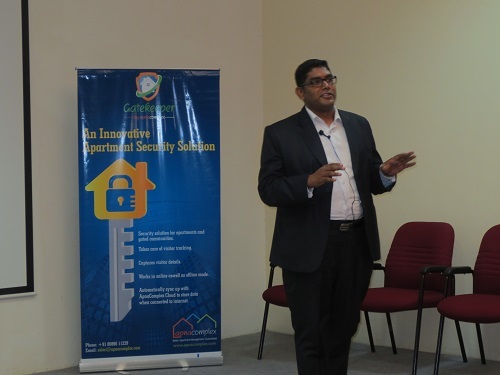 The last presentation was on the topic “Apartment Social Responsibility” – a phrase coined by Raja Sekhar, Co-founder of ApnaComplex. “Apartment Social Responsibility” is coined from Corporate Social Responsibility phrase and refers to collective responsibility of people residing in Apartments towards the neighbourhood outside their “gated” community. This topic was aptly covered by Ms Meera K, Co-founder, Citizen Matters who nudged the audience pick up the responsibility of doing more to make the neighbourhoods and city much better place. 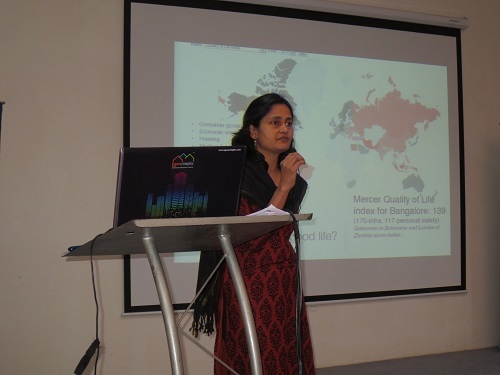 Meera shared case studies on Kasa Muktha Bangalore on how few citizens coming out of the comfort of their apartments are making a difference to the city, and about few special interest groups working on Lake Rejuvenation across several lakes and making city a better place to live. She urged the audience to actively participate in various ward committees, liaison with authorities to improve things like roads, traffic and other aspects. With all these running in everyone’s mind all the participants were interacting amongst themselves and with the speakers at the networking lunch. 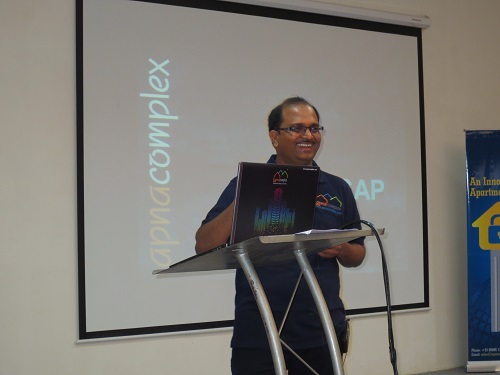 We asked for feedback on the event and every one gave thumbs up to Team ApnaComplex for organizing one of its kind event and wanted more such events that will help managing committees. All of them felt they had few takeaways which they could consider implementing in their apartment to manage it better – now that’s what is Better Apartment Management conference is all about! We have also captured the videos of all the sessions and feedback on the session which will be shared soon on our YouTube page. The entire team of ApnaComplex thanks the speakers for their time and knowledge sharing and we look forward for more such support in the near future. 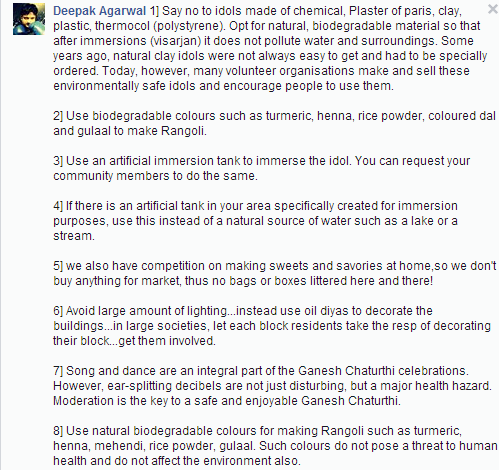 Takes away Flipkart voucher worth Rs 1,000 by participating in the ApnaComplex Ganesh Chaturthi Contest. 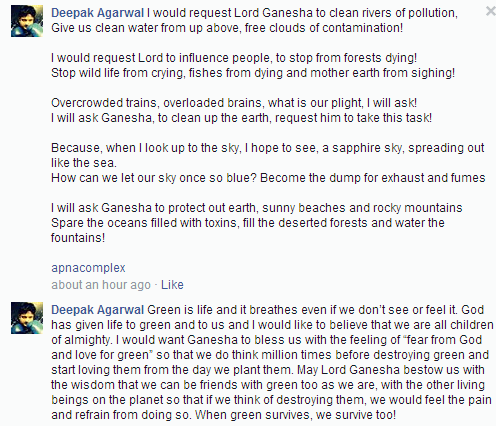 Starting this week we ran an exciting Ganesh Chaturthi contest on our ApnaComplex Facebook page. It was an open contest for all. 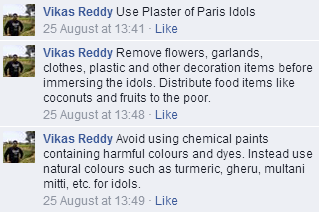 Participants had to tickle there brains, come up with an environmental friendly idea to celebrate this Ganesh Chaturthi and post the same on our facebook and twitter pages. Soumyadeep Sur has provided the most practical Eco-Friendly idea, which is not just interesting but worth considering by all. ApnaComplex is excited to reward Soumyadeep Sur with a Flipkart Gift Voucher worth Rs 1,000. It was indeed a very fruitful contest. Did you miss this one, don’t worry we have our next one coming up right away. Share your Ganesh Celebration photos with us on our Facebook and the best photo can win exciting goodies from ApnaComplex. ApnaComplex team wishes everyone a Very Happy Ganesh Chaturthi. ‘Personalization’, new feature from ApnaComplex allows the community heads and apartment owners to customize the look and feel of their portal. Choose different colors for dashboard, choose a style for the drop down menu or increase your screen space. 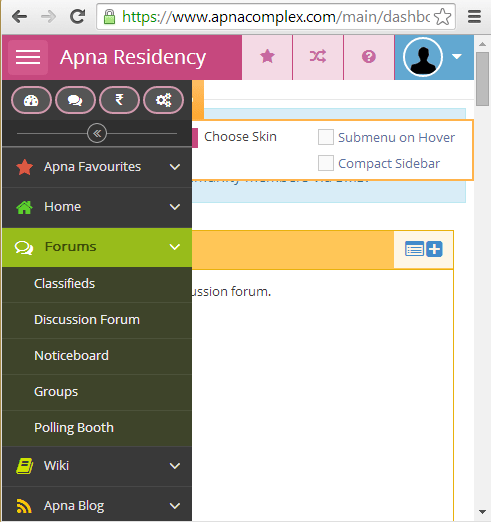 Log-in to your complex portal, provided by ApnaComplex – your Apartment Management Software provider. An orange setting button on the right hand-side top corner allows you to customize and personalize your portal. Click the Submenu on Hover button to change the sub-menu style from drop-down to hover. Check-out the Forums hover style. Increase your screen space with compact sidebar button. Click Compact Sidebar button and you get a wider screen space. Check your left side menubar, it gets collapsed. With this option the Sub-menu on Hover also gets selected automatically helping you in maintaining the wider screen space. Log-in now and personalize your portal. 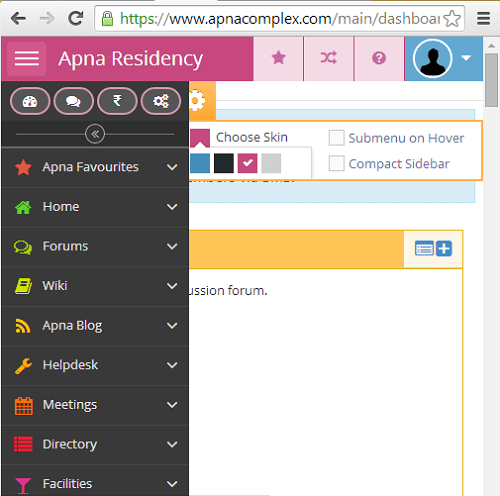 Mark your Favorites of the many Features provided by ApnaComplex, Access them Faster and Save Time. Are you the treasurer or from accounts office, frequently accessing a specific screens like Bank Reconciliation, or Approve Member Payment screens etc? Are you responsible for managing the facilities and more frequently log complaints or view action items? Are you responsible for handling the online notice board of your complex? Do these set of activities fall into your kitty and you frequently visit these pages?, then just add them to your ‘Apna Favorites’ tab and access them quicker. Its easy to get lost at times in the vast set of functionality ApnaComplex offers. Its not uncommon for us to keep getting support calls only to find out how to navigate to a particular functionality. 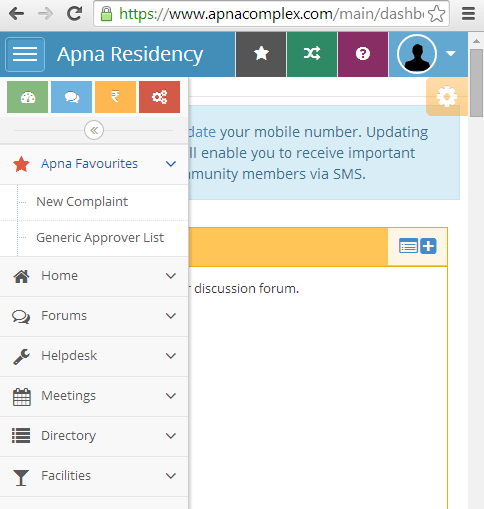 The newly introduced ‘Apna Favorites’ functionality now allows you to access your more frequently used pages on your Apartment Management Portal, provided by ApnaComplex – the Society Billing and Accounting Software for apartment complexes, quickly. 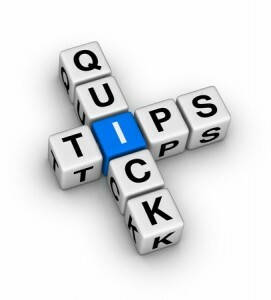 Identify your frequently used page which may usually take 3-4 clicks for you to reach there. Click the ‘Star’ button in the tool bar located on the top right hand-side of your apartment complex portal. A pop-up window will appear and allow you to name the page with your favorite word that best suits you to remember the page. Give a name and click ‘Save’. Like I named the ‘Log a new complaint’ page as ‘New Complaint’ and saved it. Similarly, you can add any number of pages to the ‘Apna Favorites’ tab. 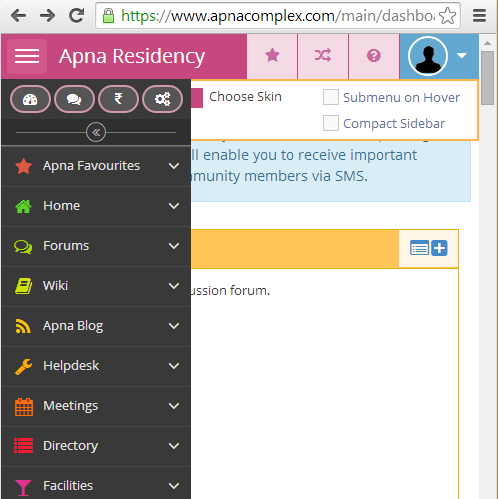 Now you can quickly access these anytime from the ‘Apna Favorites’ tab located on your left hand-side dashboard. Just click the Apna Favorites button and you will see all your added pages there. It is time you define your favorites and reduce the extra time you use to spend searching for a frequently used page. Go ahead and favorite it. Can one improve that is already the best? We just did! 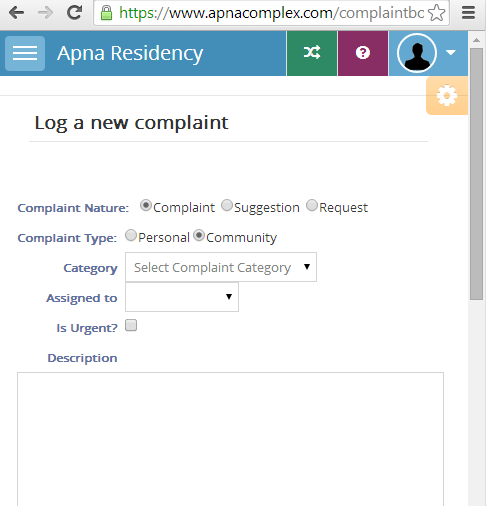 Complaint box – ApnaComplex’s most widely used feature – with its all powerful capabilities around complaint logging, tracking, auto-escalations, complaint analytics, highly configurable bunch of options – is surely the best in the business. 1. Suspend SLA calculation / Ability to put Complaints “On Hold”: Quite a few customers have expressed a need to suspend SLA calculation for complaints on a need basis. This is especially to handle complaints where there are external dependencies like procurement of new material, or ordering of a new contract etc. To cater to these scenarios we now support a ‘On Hold’ Category as one of the statuses a complaint can go to. By default the “On Hold” option is not available for complaints. This can be made available by modifying the setting in Complex->Settings->Complaint box. When a complaint is moved to ‘On Hold’ status – the SLA calculation will be stopped and it will resume once the complaint is moved off the “On Hold” status. All reports are enhanced to take the ‘On Hold’ Status into consideration. 2. Ability to de-commission Complaint Categories – This feature would come in handy if you have created many categories and do not want all these displayed when members are raising complaints. Go to Complaint Box->Setup Categories – you can see a new icon in the actions column called “Inactivate this complaint category”. Once inactivated a complaint can never be logged against a decommissioned complaint category. 3. 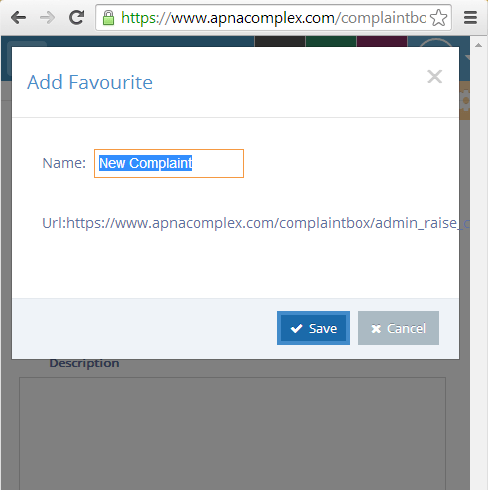 Edit Category Name and Delete complaints: ApnaComplex now supports editing of a category name and also an ability to delete complaints by relevant admins!